The three products in the HORTILED product line each have a specific application. The HORTILED Top is the most versatile fixture and is suitable for top lighting of all types of crop. 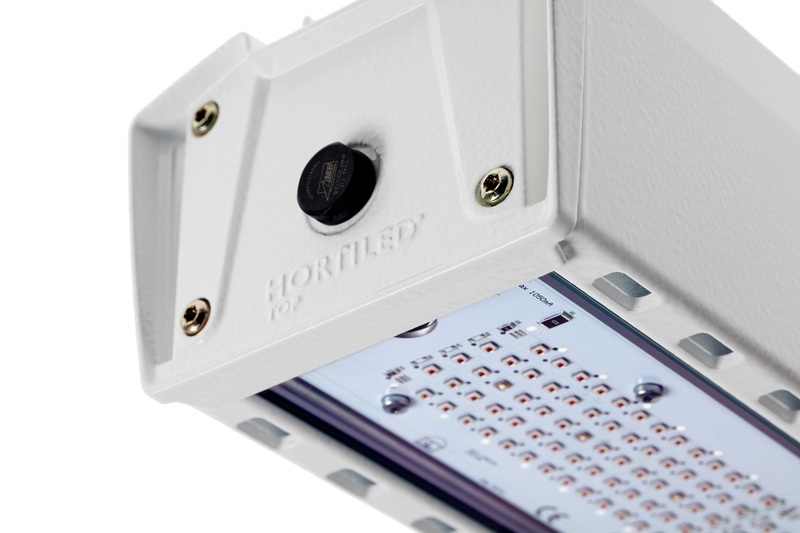 HORTILED Top is the most efficient LED fixture on the market. The HORTILED Top has an efficiency level of 3.5 µmol/Joule, while the most efficient electronically controlled HPS systems currently achieve 1.9 µmol/Joule. This is an efficiciency increase of 84% compared to HPS 1000W. This increased efficiency brings direct savings on your energy bill. Thanks to its higher efficiency, the HORTILED Top produces significantly less heat. This makes it possible to light at a higher intensity with minimum impact on the greenhouse temperature. The light output of the HORTILED Top is 1160 µmol/J, which is higher than comparable passively cooled LED fixtures on the market. You therefore need fewer fixtures to achieve the same light intensity. This means not only a lower investment, but also lower installation costs. Thanks to the smaller number of fixtures, there is also less light loss due to shadow. The special design of the compact aluminium housing provides maximum cooling of the fixture, making active cooling unnecessary. The absence of an active cooling system saves on installation costs. Optimum cooling also minimises the risk of fixture failure, thus increasing reliability. Unique about the HORTILED Top 120v19 fixtures is the optional dimmability between 0-100%. The desired light intensity is controllable from the climate computer or with the dimcontroller. The optional connection with the climate computer dims the HORTILED Top 120v19 when there is enough daylight and intensifies when the daylight intensity drops. This way you achieve an optimal and constant light sum for your crop. This leads to an optimal growth result and a more controlled use of energy. The HORTILED Top 120v19 is available with various colour spectra which have been defined on the basis of extensive research into colour combinations that deliver optimum results. We will work with you to identify the most suitable spectrum for your crop. Naturally, it is also possible to develop a custom project-based LED recipe. The HORTILED Top is easy to install on both C-profile and trellis rail. This means that a ‘plug-and-play’ switch from HPS to LEDs can take place without any problems. The fixture is available for the commonly used greenhouse voltage of 400V (nom. ), which requires minimum effort for installation purposes.